A found footage, ecological horror, creature feature mash from Barry Levinson; one of the best of the sub-genre in recent years. 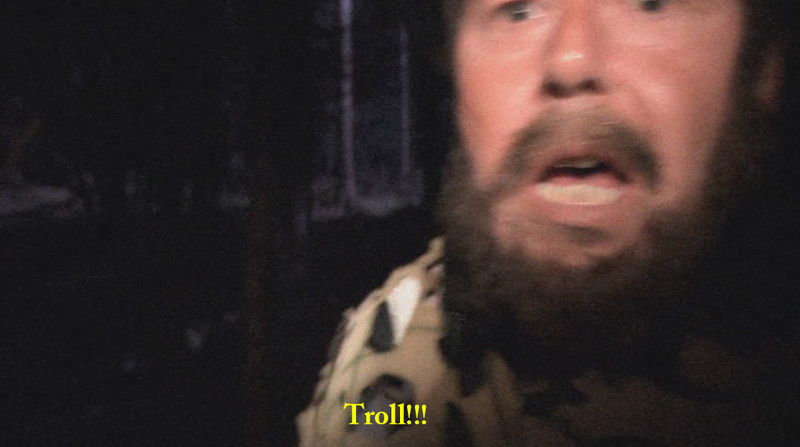 Trollhunter. 2010. Directed & Written by André Øvredal. Starring Otto Jespersen, Hans Morten Hansen, Tomas Alf Larsen, Johanna Mørck, Knut Naerum, Robert Stoltenberg, and Glenn Erland Tosterud. Momentum Pictures. 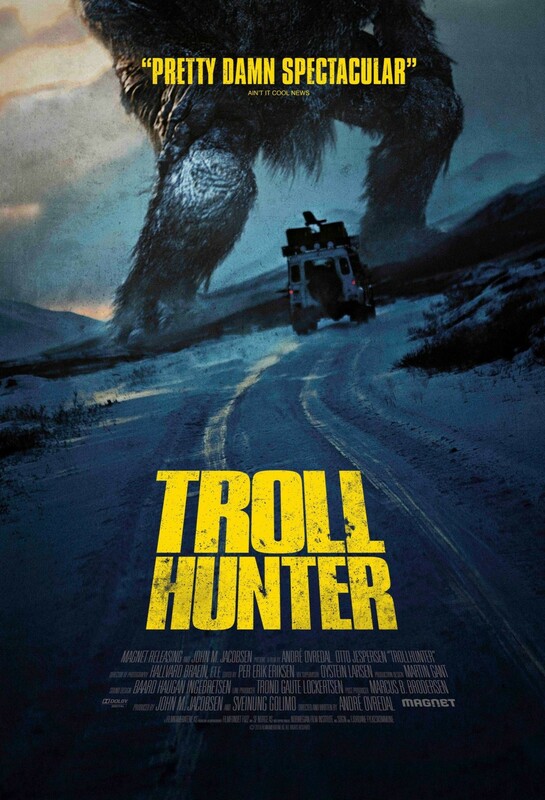 When you hear the title Trollhunter it isn’t easy to imagine what the plot and story of the film might be. You guessed it. Basically, a group of students are making a documentary about a slew of supposed bear killings, and a possible poacher. While visiting places where the poacher supposedly killed bears, illegally, the students talk to hunters, as well as a man from the Wildlife Board in Norway. Though there is some doubt, the consensus is this poacher, Hans (Jespersen), has been killing animals, regardless if they were bears or not. Then the students start following Hans until one night they see wild lights in the forest while trailing him, and roars in the trees. Eventually they discover Hans does not hunt bears, he hunts trolls. Of course they don’t really believe him at first, but soon enough it is all too obvious Hans is telling the truth. And so the students continue on with Hans to uncover the truth about trulls that the Norwegian government hopes to keep covered up. 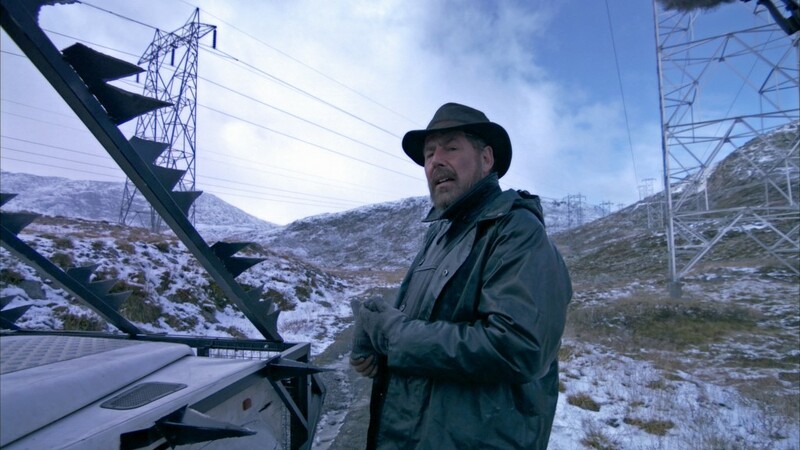 Most obviously to me when I first started watching the movie for the first time, Trollhunter is one of the more original films in any genre, from any country I’ve seen – in a long time. Not to say there aren’t original films. Yes, of course there are, I’m not crazy. But this film is one of the more unique of those originals probably in the past decade. This story is fresh. They take found footage, which can often be a tired genre nowadays with the flooded market of bad horror entries using its premise (side note: I love found footage – when it’s used well), and used it in a fantasy style. Though the effects are not always perfect, the trolls are absolutely incredible. When you first get a good look at one of them, it’s fascinating. They did a great job of taking a fantasy element and dropping it into a modern setting. I suppose the fact it’s a Norwegian film helps, as there’s a lot more folklore and such from their culture/geographical location to carry the subject along. I feel if the Americans wanted to remake this, which I’m sure they’ll do (apparently Chris Columbus’ company has the rights – not sure if this is the case any longer or what), they would have to pick some other type of monster instead of trolls; the trolls just fit so well with Norway, and perhaps might fit with other European locations. That’s what gives the story some better pull, in my opinion. 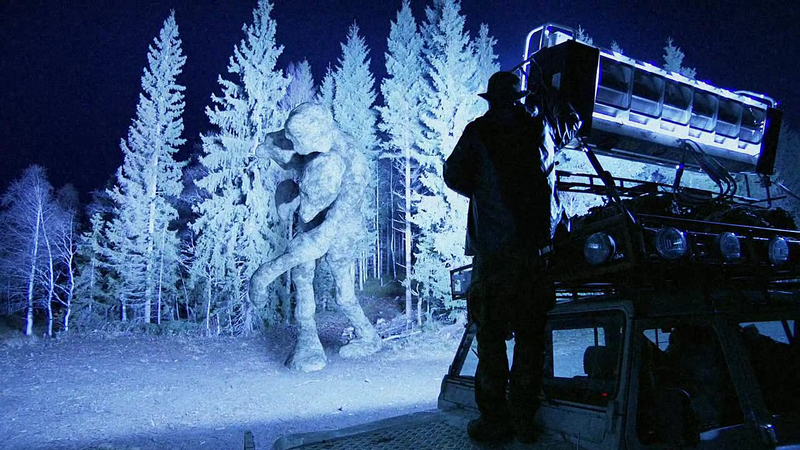 The actual physical locations used in filming Trollhunter are also part of what makes it great overall. There are some beautiful landscapes. The entire film is played as a mockumentary, which also lends itself well to the story, as there are some real great silly bits. It helps that Otto Jespersen, as well as some other Norwegian comedians, were in the film. I didn’t know this until I watched the special features. But you can tell a few of the actors have great comedic timing. While there are bits that are definitely verging on horror, though not blood & guts style, the best parts of Trollhunter are the ones which are played firmly with their tongue jammed in cheek. This is absolutely a dark fantasy film, but the comedy really shines, and the mix of genre blends pretty well. Jerspersen especially as Hans really does a fabulous job at bringing out laughs, even at times when you’re not sure if you’re supposed to be laughing or not. As I mentioned before, the special effects are not always spot on. That’s not to say they’re bad. Not in the least. The budget, in American dollars, was only $4-million. Well, take a look at some of your favourite big budget pictures, and compare those with that of Trollhunter. They did a fabulous job with the amount of money they were working with, and it shows. Not every troll looks flawless, but so what? They still look like massive god damned trolls. They were at times funny, but always creepy, and always terrifying. The look of the trolls works, regardless of the effects. My favourite troll is the one with three heads; I don’t know why, just dig it. A lot. As a film, Trollhunter is topnotch. However, I could have used some better acting. That’s my only problem. Jespersen was solid the whole way through, but some of the supporting actors weren’t exactly great. They weren’t poor, either. They could’ve just used some work. I can’t really knock them for the few parts where their special effects weren’t perfect because, as I mentioned, the budget wasn’t huge compared to most films. Especially for something indulging the fantasy genre the way Trollhunter does. Overall, I loved this film, and I can watch it often when I want a fix of both some fantasy, as well as a bit of comedy. The Blu ray release for Trollhunter just don’t quit! Love it. There are some deleted scenes, plus they include some moments of improvisation while filming, and to add, a bunch of bloopers. All a good time. Then there are also some extended scenes thrown in. One of the best featurettes is the visual effects; they give us a nice little look at some of the work they did. You really get a better appreciation for the film watching a lot of the behind-the-scenes extras. Any fan of foreign films, whether you enjoy drama, comedy, horror, or whatever, will certainly get a treat if they check out Trollhunter. Like I said, this is dark fantasy, all the way, but the comedy really sustains it. Not that you couldn’t make a deadly serious horror about trolls; you absolutely could. My belief is that Trollhunter treats things seriously at times while knowing exactly when to pull out the comedy bag of tricks. You won’t be disappointed. This is a great film. Also refreshing to get a look at something that isn’t typical; this is a movie with a bit of creative backbone. I hope others will check out the Blu ray, and really hope those who watch the movie enjoy it the way I did.